We are a home run ministry. Our mission is to spread good deed/sacrifice beads, rosaries and prayer cards to as many people as possible. So far we have reached out to many parts of the world – India, Philippines, South Africa, Ghana, Ireland, the UK, Canada, USA, Australia , China and more. As a child, St. Thérèse, the Little Flower used a string of beads to count her sacrifices and acts of love done for God, in that way she was able to advance in perfection daily. You too, can grow in holiness by following the example of the Little Flower. Sacrifice Beads or Good Deed Beads are a string of ten beads, which can be pulled and remain in place. They are used to count the acts of love or sacrifices a person makes in a day for God. The string of sacrifice beads helps a person to grow in perfection by increasing their acts of love they do each day. The sacrifice beads we make also have a fixed Our Father bead on the end of them. Thus they double up as a rosary. Some History on Sacrifice Beads / Good Deed Beads? As a child St. Thérèse was encouraged by mother to offer little gifts of love each day for Jesus. As a child she would eat the spinach but offer him her dessert instead as she felt this was nicer for him to enjoy:) Her mother Zelie Martin instilled the importance of offering these gifts of love each day in all her children. After St. Thérèse’s mother passed away her sister’s continued to encourage her in her daily offerings to Jesus. St. Thérèse made her own set of sacrifice beads that she used each day leading up to her First Communion to help prepare herself. Her set of beads were actually called her “chaplet of practices” it featured a medal of St. Benedict, a cross, white beads and blue string, it also had more beads then we have on the ones we make. During the months leading up to her First Communion an a daily basis she would offer an average of 28 sacrifices. To the left is a picture of her original Chaplet of Practices which one can see in person currently in her childhood home in Liseux which has been turned into a Museum. If you are ever in Liseux it is a beautiful experience to go through a tour with one of the beautiful sisters who take you through the home. 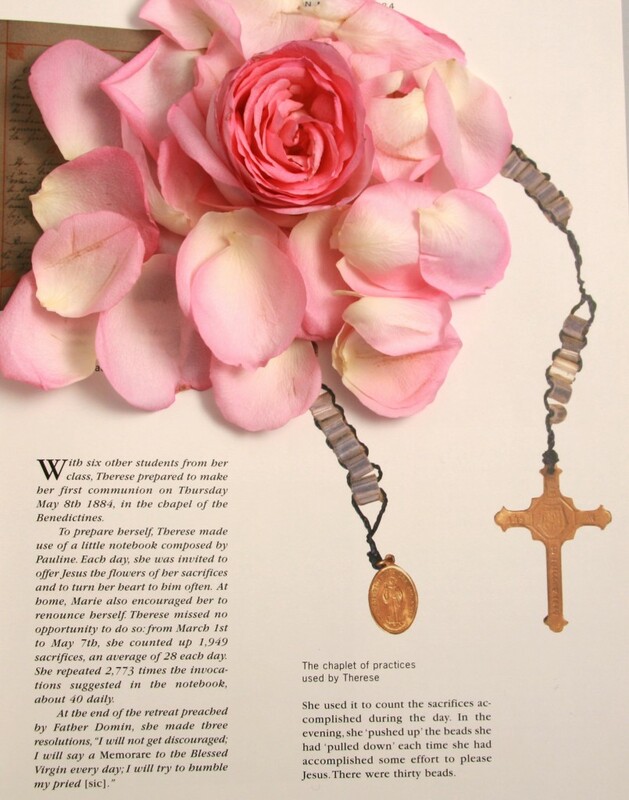 A great resource for learning more about St. Therese is a book called Therese and Liseux, it is in our opinion one of the most beautiful books ever made on a Saint! As the years passed the “chaplet of practices” which can really be attributed to Zelie Martin grew in popularity and became known as St. Thérèse sacrifice beads and in more recent years St. Thérèse Good Deed Beads. Children’s Treasure Box Books featured the story of St. Thérèse and her use of sacrifice beads at the end of the story they featured a illustration of how to make the beads. This was where my husbands family first learnt about them in his childhood. How The Little Ways Came to be! A set of red sacrifice beads made by my sister in laws still remained in their childhood home over ten years later, when I came a cross them one Christmas morning. After my mother-in-law explained these beautiful beads to me a love grew or more appropriately was set on fire in my heart. I felt an instant calling to spreading these beads of love to anyone I could. The next day was boxing day my husband and I set off to Michaels were we purchased bright orange and blue beads, we found fishing twine at Walmart and were given various metals and plastic crosses by my mother-in-law. We started the next day making 100 sets St. Thérèse sacrifice beads to distribute to youth at a New Years Retreat we were helping facilitate. The original sets contained 10 beads and only one medal or cross on the end and were left so the youth could tie them on their backpacks on to their pants. As time progressed we started to include the extra bead on the end so that they could double as a rosary and an extra medal and instruction card explaining how to use the beads. The love to spread these beads continued to grow in my heart and after a prayer to St. Thérèse and to our Lord with a special request for purple or pink roses if we should move forward with this ministry – I received 6 purple and 6 pink roses with a note card covered in roses that afternoon… The Little Ways ministry was born. In the early 2000’s we only offered the pre-made sets of St. Thérèse good deed beads but thanks to the inspiration of my father who commented when we were making an order of 250 beads on night – he said “if you feed someone fish they will be hunger the next day, but if you teach them to fish they will never be hungry again and they will teach other’s to fish”. So thanks to my father we began making St. Thérèse sacrifice bead kits so that we could try to full fill the mission of spread these beads throughout the world. As the years have passed many people have joined us by starting their own ministry to spread these beads of love in their own communities and countries – the first person to join us was my Great Aunt Helen in South Africa, followed by youth in Ontario, a grandmother in the US who sends them to Ghana, and on and on it spread, just two weeks ago a priest in the US contacted me to let me know he is personally making 1000 sets to give to his parishioners for Lent! The one thing about St. Thérèse beads is that you can’t just make one – once you make on you want to make another to pass it on and so the love multiplies and spreads! St. Thérèse Sacrifice Beads are an excellent activity for groups, feasts, home-schooling or any day! A great activity to do with your youth group, camp, class, CWL, First Communion class, Confirmation class, class project or on a retreat. Make wonderful gifts for any occasion! Sacrifice Beads are especially good to use to help encourage good behaviour in children. They can challenge themselves to see just how many “presents” they can offer each day to God out of love.